Happy December, everybody! It’s hard to believe we’ve come all the way around to the end of the year again, but happy to have completed the journey. For whatever reason, this time of year always stirs a wanderlust in me for getting out on the trail somewhere. It may be a conditioned response – with everybody’s busy schedules in the summer, for many years it seemed like deep, dark winter was the only time we could find an excuse and time to get out. So now, those unique winter things – like seeing the sun on the horizon through bare trees (no leaves in the way), hearing the wind rush through valleys with no leaves to impede it (it’s a much different, harsher, more threatening sound), the smells and sounds of dead leaves, and of course the bite of cold, no-humidity air – make me think of camping somewhere. Anywhere. The good news is, of course, no bugs! Things have changed dramatically in the last couple weeks. 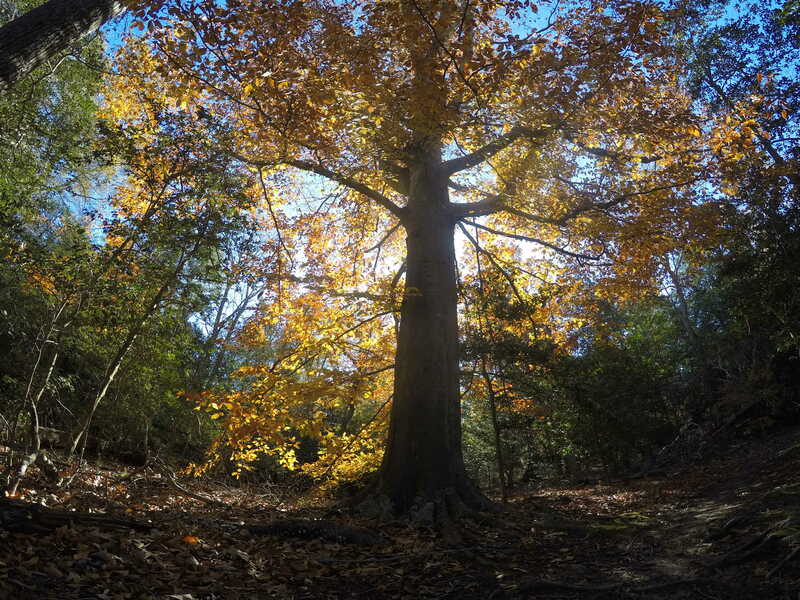 I got out for a short hike on Black Friday (video link below), and the beech trees were still golden in the sunlight. Now everything is dead – most trees are completely leaf-less now, and the beeches (as they do) are holding on to clattering, dead, brown husks. But I’m planning a few trips, as we speak. I’m a little like a kid in a candy store. I’m not much of a “gearhead” – I appreciate the advantages of new equipment, but I tend to be happy with what works until it wears out, and then I get an upgrade. What gets me going is maps. I LOVE maps. To me, they are full of possibilities – what’s here, or there. And just over that hill I could see that, or camp there. I can (and have) literally spend hours pouring over topographical maps of the backcountry just picturing the terrain with me in the middle of it. So I’m excited, not about a particular trip, but the planning, the thinking, the figuring. I’ve got a Wilderness Survival thing coming up with the Scout Troop – we won’t be deep in the backcountry, but some contrived calamity will befall us, force us to plan an exit strategy, signal for help, build fires with minimal equipment, build shelters out of fallen debris, and spend an anxious night outside… It’s all safe, and pretend, of course, but it reinforces good skills, and it’s fun. Sleeping in a shelter you built yourself is quite confidence-building as well, and I’ve got 15 or so boys eager to teach, learn, and show off their own skills, while I get to help the Scout in charge work our scenario and recon locations, etc. I’ve got a backpacking trip to a cabin sometime in January. Might have to trek through some snow. I’m looking at a solo backpacking trip (or possibly with a fellow YouTuber) in the swamps of North Carolina soon – now’s the time, since there are no bugs! Possibly hitting the trail with a friend in Texas. And on top of that I’m negotiating access to an old rail-bed that is not yet a rails-to-trails success story, and through-hiking that to (hopefully) raise awareness on the gem it might be. It’ll happen though, and in the meantime, I get to window shop, plan, get my logistics in order – so when the opportunity presents itself, I’ll be ready!